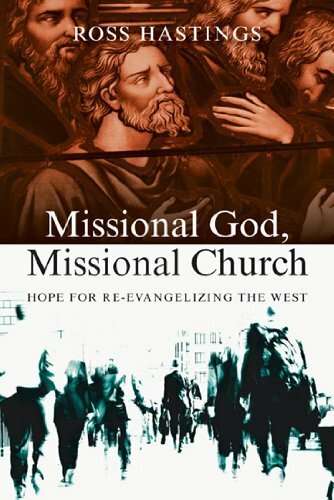 Ross Hastings, Missional God, Missional Church: Hope for Re-evangelizing the West (Downers Grove: IVP Academic, 2012). ISBN: 978-0-8308-3955-1; 321pp. A guest post by Kevin Ward. The words ‘missional’ in general and ‘missional church’ in particular are real buzz words in the church at the moment, and nowhere more so than within the PCANZ. Put ‘missional’ in front of anything and it legitimates it. The missional movement has much to offer in thinking about our current situation and its challenges going forward, and is something I have engaged with ever since the book Missional Church (edited by Darrell Guder) was published in 1998 – yes that’s how long it has been around for. My great concern is that it has rapidly become a fad, and like so many of those that have come and gone in the forty-plus years I have been involved in church leadership, it too will go. Ross Hastings’ book is, I believe, one of the most important and helpful of all the books that have been published with the word ‘missional’ in the title. This is largely because it is called ‘Missional God, Missional Church’. The order is important. A missional church flows out of a missional God, and so the first task we face as a church is not developing new forms of ‘missional’ churches or new programmes that will make our existing churches missional, but actually coming anew to a proper understanding of who the God whom we know and experience through the Father’s sending of Jesus and the Father and Son’s sending of the Spirit truly is. Hastings takes us back to these key foundational understandings, before moving us on to envision what this means for our understanding of the church and how we engage with the world in God’s mission in it. In the missional movement the key text is John 20:21, ‘As the Father has sent me so I am sending you’, which is followed by Jesus breathing the Spirit onto the disciples. Sadly, in the life of the church this has played second fiddle to Matthew 28:19–20. Hastings frames the whole book around a wonderful exposition of John 20:19–23, which he calls ‘the greatest commission’, arguing that in this picture of the frightened disciples huddled in the upper room with Jesus in their midst, all of the elements needed for the church to fulfil its calling as the community of the God of mission are present. Based on a sound Trinitarian theology, the book moves on to develop a solid ecclesiology and missiology, both of which reflect the character of the God whose life they flow from. One of the great values of the book is that it corrects many of the false dichotomies that can be found in so much other work. The missional God is both a sending God and a gathering God, and so the church needs to both send and gather. Flowing from this, therefore, the church needs to be both deep and wide, grounded in the traditions of the faith as an alternative community but taking God’s shalom far and wide into the world. Both worship and mission are intrinsic to the life of the church. To do the latter it needs to inculturate the gospel without becoming enculturated itself. In other words, incarnate the gospel into the culture of the context it finds itself in without accommodating itself to it. Indeed, the theology of culture and personhood in the book is one of its great treasures. When it comes to the practice of mission, Hastings has a broad and holistic understanding of mission – what Renee Padilla calls integrated mission, which is much more true to a biblical understanding than the rather limited concept found in much of the missional church material. There are two final things I am pleased to find in this book. Missing in much of the other literature is a great love of and passion for the church, which while not being the goal of God’s mission, is certainly critical in it. Much of the missional church material takes a critical and almost dismissive stance toward the church. ‘The essential sociality of salvation, implies the essential institutionality of the church. The question is not whether the church is an institution, but rather what kind of institution is it’ (p. 133). Finally, Hastings gives adequate attention to the role of the Spirit in both the life of the church and God’s mission, something that is missing in much of the other material. Ross Hastings parents were missionaries for 60 years in Africa, he has PhDs in both science and theology, has served as minister in two urban churches, and now teaches theology at Regent College in Vancouver. All of these factors help to make this a book which combines solid biblical and theological understanding, clear social and cultural analysis, pastoral empathy for people and the church, and a deep concern for mission in western societies – a wonderful holistic treatment. I cannot recommend it enough for those who are concerned to work in the deep and integrated way that is necessary if our churches are to truly live out the life that our missional God is calling us to. Well written and helpful. Thank you. I second John Muse’s comment about the review, but have a few questions about the book. Why the opposition between Matthew 28 and John 20? In the former, everything depends on the authority given to Christ to do the sending. Furthermore, the disciples are told that Christ will go with them. This seems an unnecessary rhetorical move. I’m curious to hear more about the role of the Spirit in conversation with the material on worship and mission. Are these two aspects of the church’s life considered equally important? If so, why? Are they ordered in some way? If so, how?